Izakaya, or Japanese gastro pub, is a relatively new type of Japanese restaurant in Malaysia. It is basically a pub with a proper bar and a full kitchen. You want to have a few beer or sake? Sure. You want a full meal? They’ve got that covered too. Robataya Izakaya is a relatively new comer of such restaurant in KL. 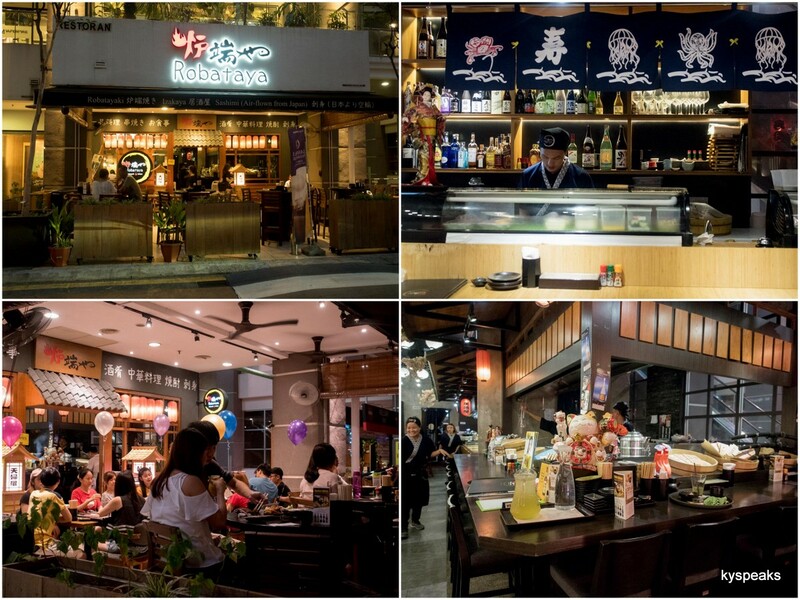 Located in Publika, they have a pretty extensive menu offering raw fish, ramen, rice dish, tempura, salad, grilled items, and more. 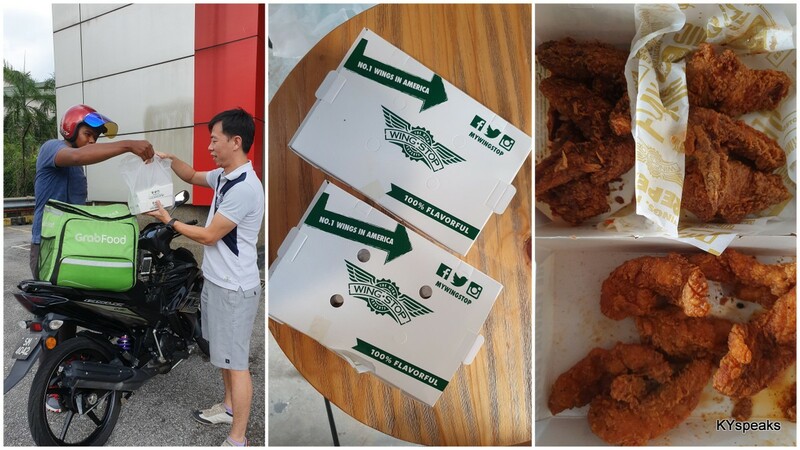 A week ago, we headed there on an invitation to try out what they’ve got to offer. We started with Okan Sashimi (RM 70), a sashimi platter with 5 different types of fresh seafood carefully arranged on ice. During our session, we had salmon, salmon belly, sweet shrimp, tuna, and I believe, butterfish. While it may not be the super premium quality sashimi, (that’ll be their air flown, LIVE seafood as displayed by Haze) the portions were generous and it was actually quite a treat for the price. 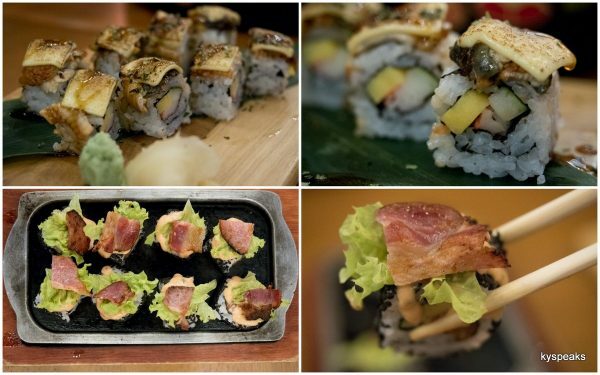 For those wholikes rolls, The Robataya Teppan Roll (RM 28) is one you should try. There’s salmon inside, mayo, and grilled bacon on top! The taste was rather unique, and of course, anything is better with bacon. Una Chizu Roll (RM 25) is a slightly more creative interpretation of your usual unagi roll, as they’ve decided to add cheese to the mix. I think the result was pretty good to be honest. Salmon Oyaka Sarada (RM 26) turned out to be one of our favorite dishes of the night. Laden with plenty of crispy salmon skin, the salad also have quite a generous portion of raw salmon in all those mustard leaves & cherry tomato in the rather awesome sesame dressing. I’d have this for lunch anytime. 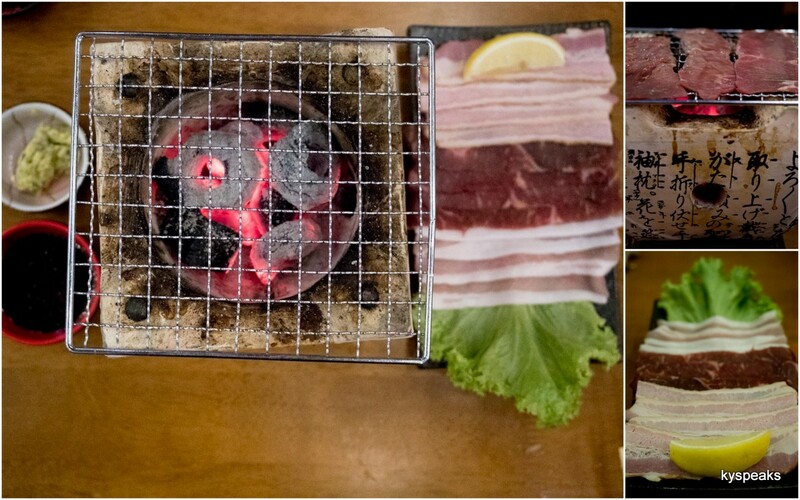 You can’t have a proper review of an izakaya without having some skewers. 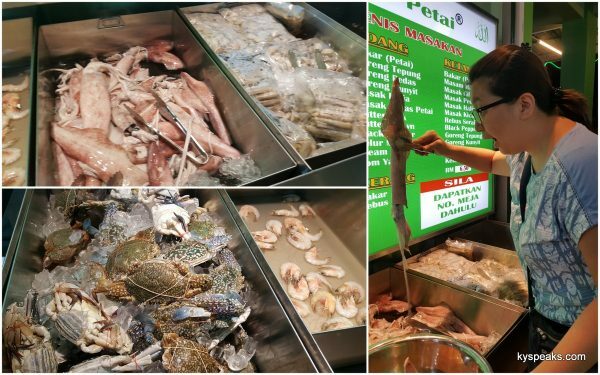 We tried teba (chicken wings, RM 6), buta (pork belly RM 6), uzura bacon (quail egg bacon, RM 6), banana bacon (RM 6), tomato gyumaki (tomato wrapped with beef, RM 7), tsukune (chicken meatball, RM 5), momo tama (chicken thigh wrapped with egg, RM 6), and negima (chicken with leeks, RM 5). 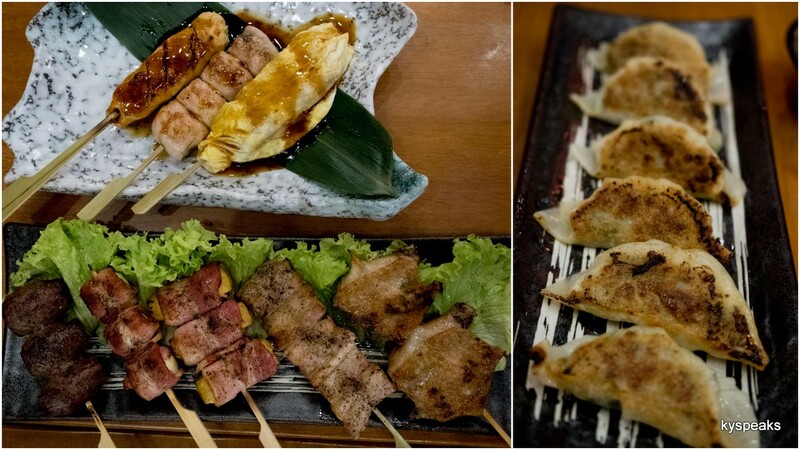 While these are some pretty good skewers, the one that stood out the most was the momo tama, the egg was prepared to a rather soft consistency and for some reason worked really, really well with the chicken thigh. We gobbled that up pretty fast. If you enjoy BBQ, there’s only one way to improve the experience – by having it indoor, with air conditioning. 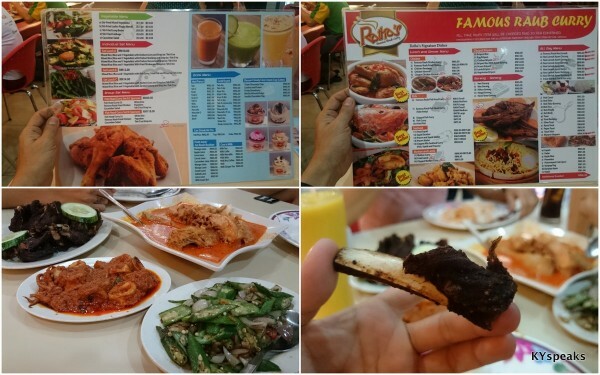 The San Ten Zeppin sumiyaki (RM 55) gave us just that. There’re pork belly, bacon, and Australian beef. The meat are pretty thinly sliced so they cook rather quick, if you mess it up, it’s your own fault. As if those weren’t enough food for 4 skinny Asians, we also tried their Teppan Ika Geso (cuttle fish, RM 15), Spare Pork Ribs Teriyaki (RM 33), and Akaebi Olive (RM 42). The cuttlefish should make for a very good side dish for beer, and while I thought the ribs were a bit dry, I did enjoy the olive shrimp quite a fair bit, the olive gave it a bit of sweetness that complements the spicy deep fried shrimp quite well. Overall, we did enjoy our dinner at Robataya. There are actually 2 other izakaya at Publika, and it’ll be tough to try to put a ranking on the list as they each have their strength and offers quite a different set of menu. 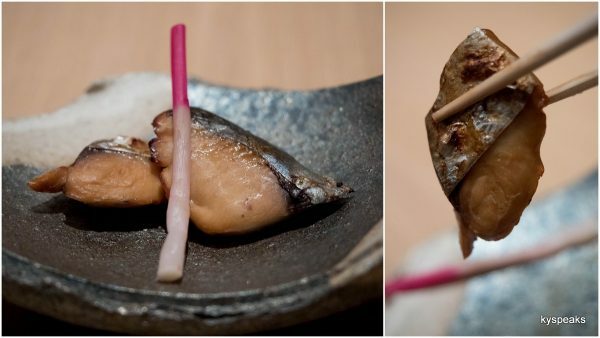 You can’t realy go wrong if you pick Robataya for a meal, or some sake. Of the five restaurants recently opened at Isetan The Japan Store’s 4F The Table, Sushi Azabu would be the one that has the most prestige. 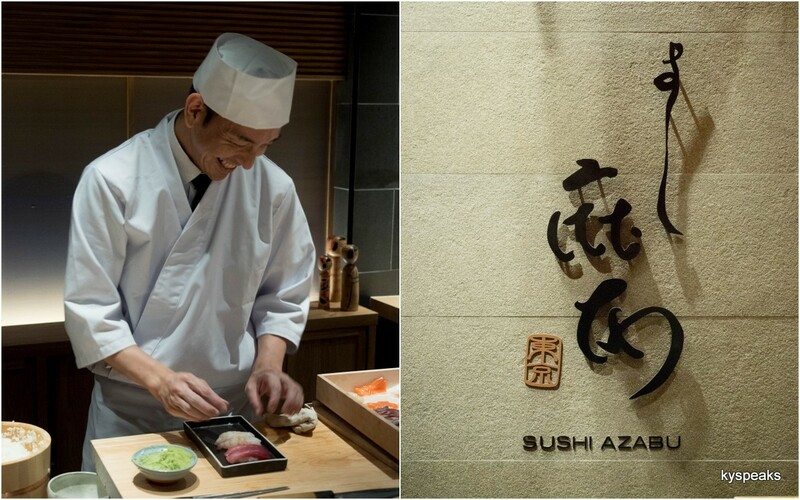 An offshoot from the Michelin star restaurant from New York, Sushi Azabu promises authentic and intimate dining experience in its 40 seat set up. We sampled a 5 pieces of sushi from Chef Saito Makoto Sam during the launch and came away impressed. So a week after the event, we decided that a proper meal at Sushi Azabu was required. 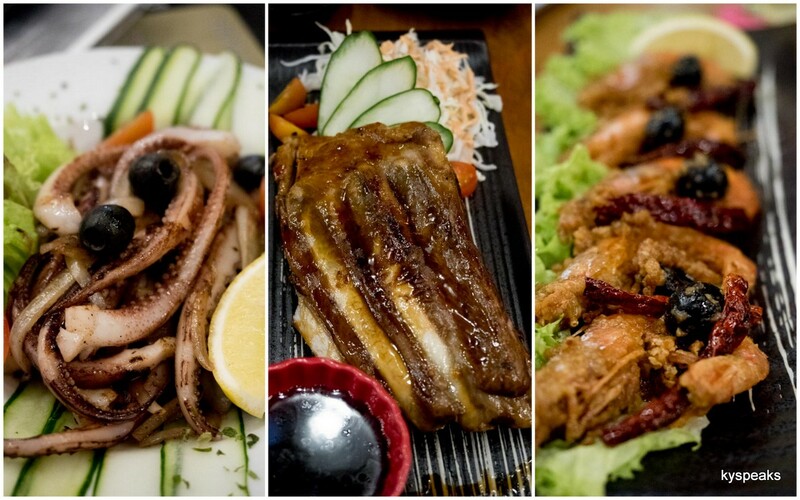 Or you could go all out with the Omakase menu for RM 420 and let the chef decides what you should have for dinner. Obviously, we went for broke. 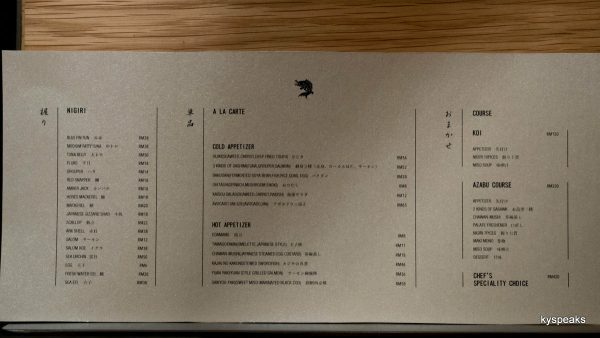 So these are the dishes we had for dinner on the 1st of March 2017 off the Omakase menu at Sushi Azabu. 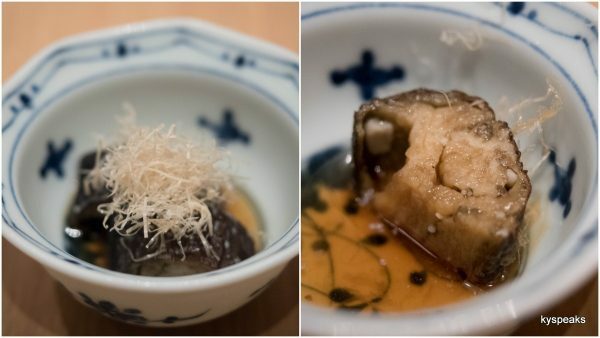 Nasa Nibitshi was our appetizer, a deceptively simple dish consists of fried eggplant in some very light broth/sauce and topped with finely shaved bonito flakes. Light with very subtle flavor, it does the job well to leave us wanting for more. Next was sashimi in the form of kampachi, tai, and aji; or yellow tail, sea bream, and horse mackerel. 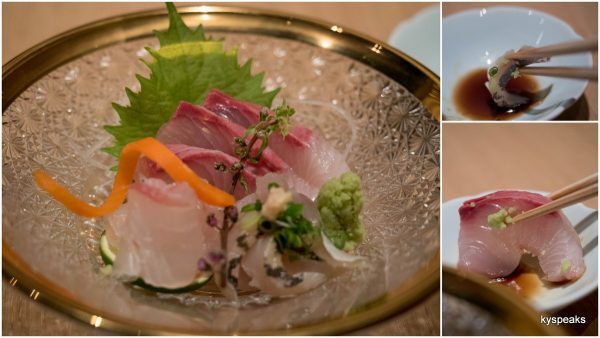 The quality was top notch, and somewhat surprisingly our favorite was the horse mackerel. The freshly grated wasabi too was a treat in itself and we wasted none of it. 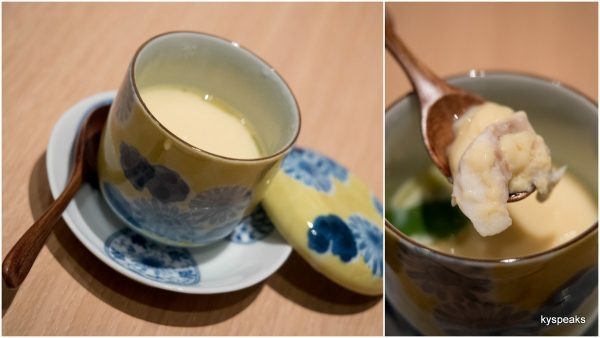 Chawanmushi was our next dish, the version here is simple, no fuss, but very well executed. 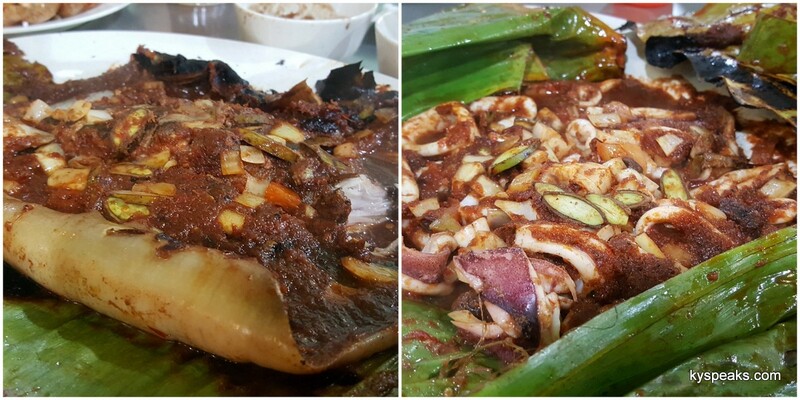 Grilled Spanish mackerel came next, we thought that chewing this together with the pickle yield the perfect combination of flavor that simply explodes in your mouth. This was a very well seasoned traditional dish. Stewed sword fish came next, a dish that is new to me. 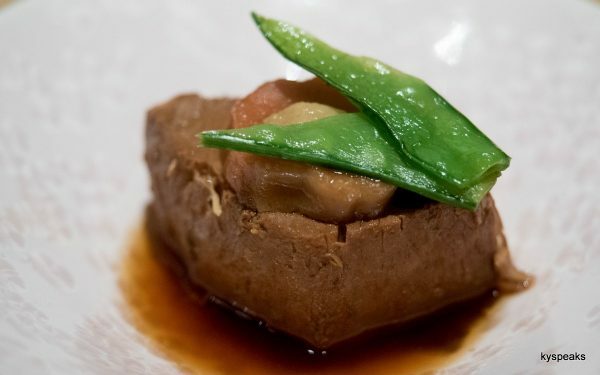 The fish is topped with a piece of starchy cube that compliments this savory dish quite well, though I felt that perhaps the sophistication of this dish escapes me. Someone with more experience in Japanese cuisine will probably enjoy this more than me. 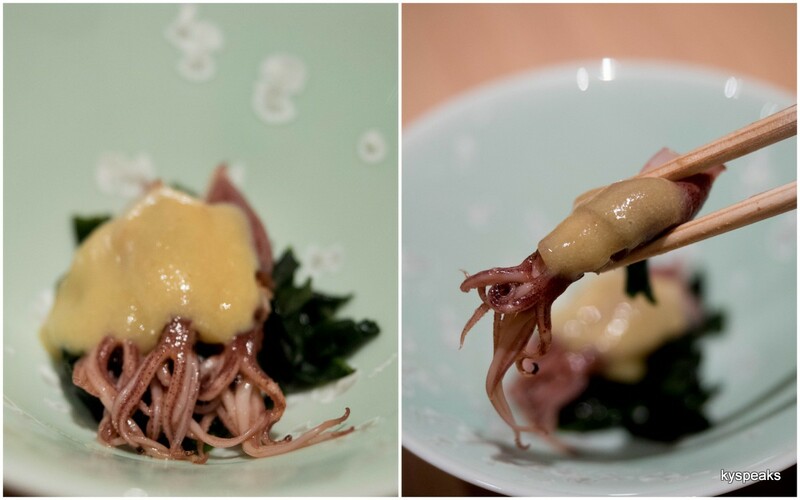 Then came the cutest dish of the night – firefly squid with sweet miso. A perfect balance of sweet, salty, and savory taste that is further accentuated by the freshness of firefly squid, this was one of my favorite non-sushi dish of the entire course. 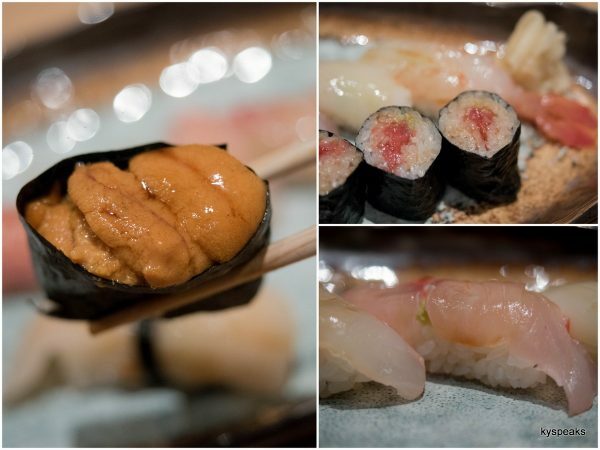 The main dish was of course, sushi, and we got ten pieces of these goodness in the form of chutoro, cattlefish, snapper, golden eye red snapper, striped jack, sea urchin, fat tuna roll, and raw prawn. At Sushi Azabu, they take the guesswork out of eating sushi. 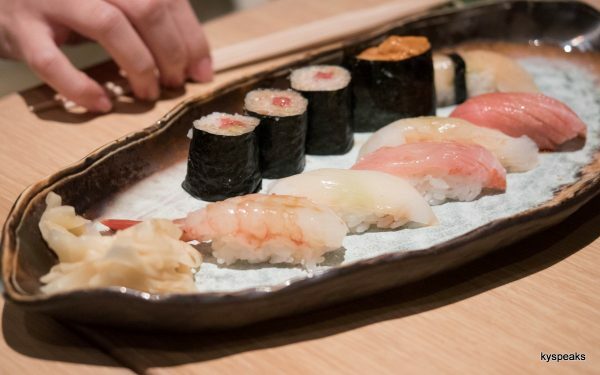 Chef Saito expertly apply the perfect amount of soya sauce on each piece, as well as the appropriate amount of wasabi his experience hands deemed worthy of the sea bounty. So you simply just.. eat, no dipping into the saucer or fiddling with wasabi, grated or otherwise. The result was an experience worthy of the asking price. 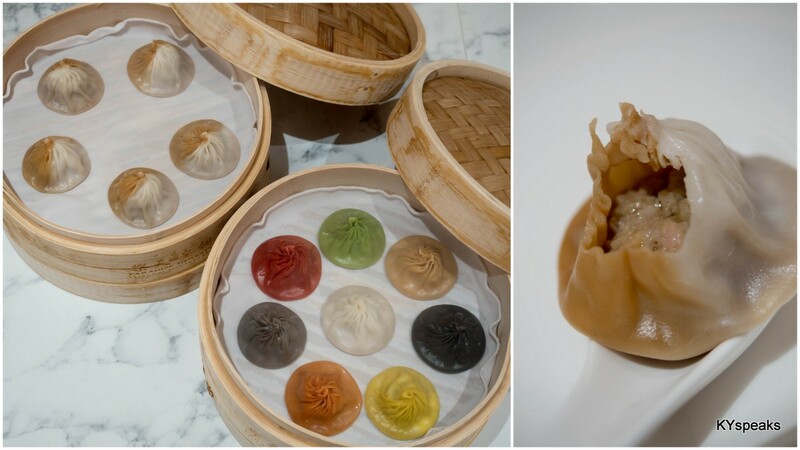 Each piece was perfect, and each offers an expression in some of the bests Japan has to offer. We thoroughly enjoyed and if I say I don’t miss it as I am writing this, I’d be lying. 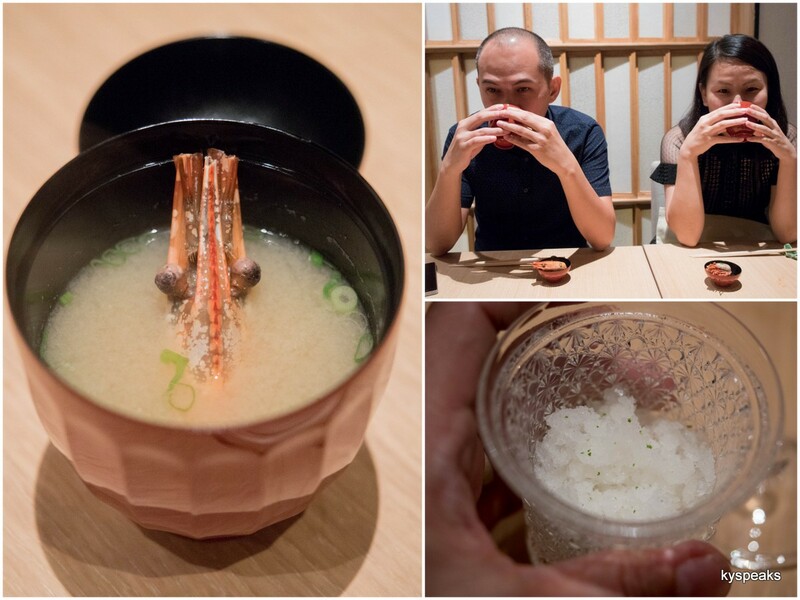 A relatively simple bowl of miso soup with prawn head helped wound us down, and we concluded the dinner experience with a simple dessert of yuzu shaved ice. 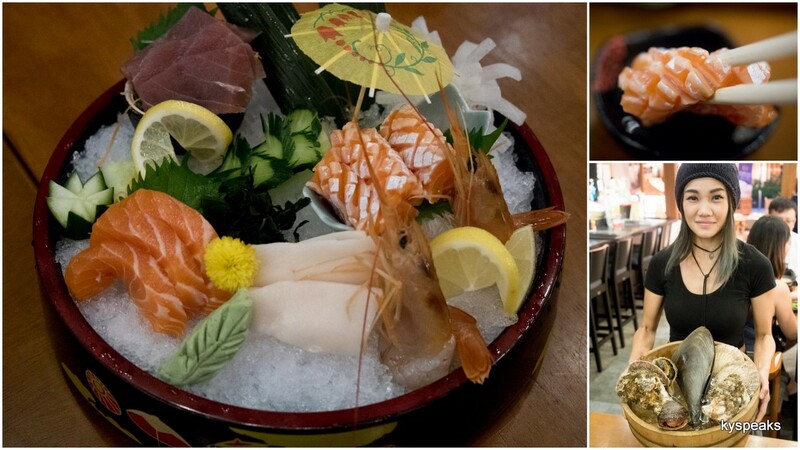 If you’re a sushi lover, this is surely a place to check out. I think I’m going to be back to try their more affordable menu one of these days. 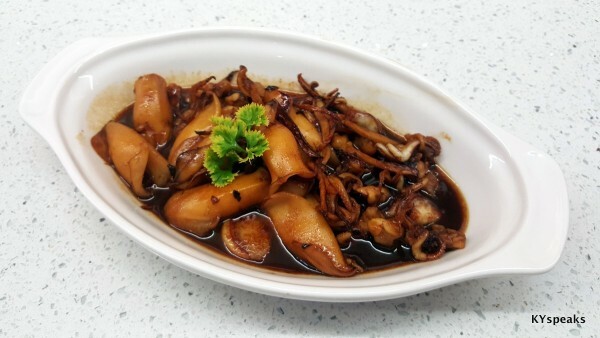 I remember one of the dishes I really like as a kid involving squid is the one with some sort of thick dark sauce mom made, so naturally when I discovered that we still had some squid in the fridge, I tried to replicate the dish at home. After a bit of exploring on the web, I think I finally nailed down a version that came up pretty good. 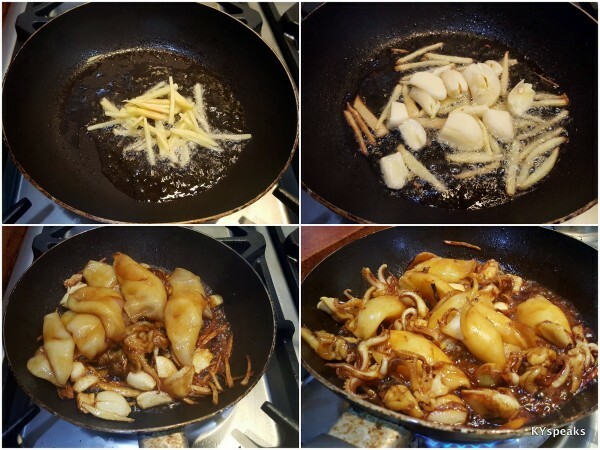 Here’s the simple stir fry squid with dark soya sauce recipe, give it a try if you love squid like most of us do! To be honest, the recipe uses more than just dark soya sauce, naming is just for simplicity sake. 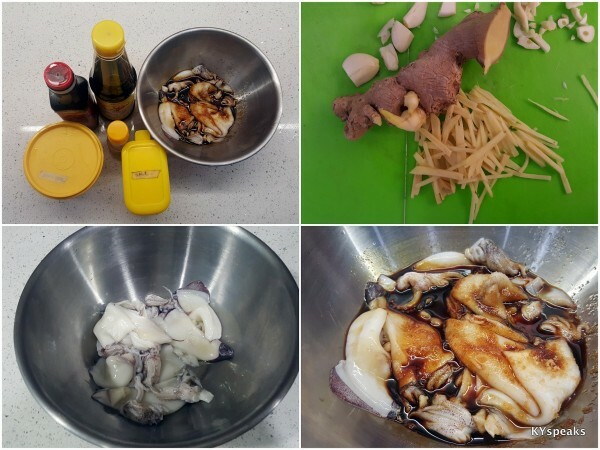 It is really a rather simple recipe, I hope you try it. Happy cooking! 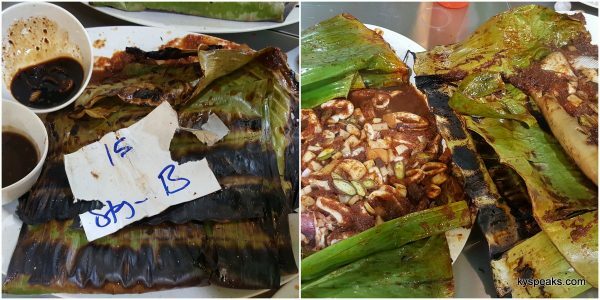 For many of us, there seems to be only two versions of Halal Indian cuisine served in this country. 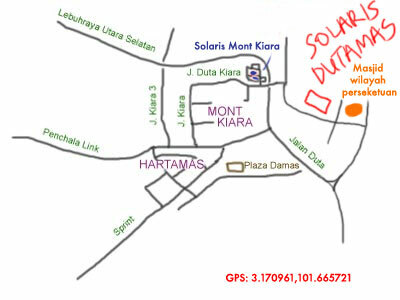 The high end, and the 24-hour mamak shops. There’s certainly a gap to fill isn’t it? 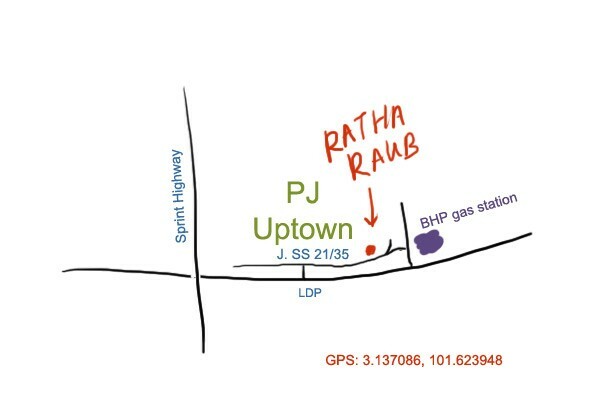 That’s where restaurants like Ratha’s Famous Raub Curry fits in, a casual dining that serves just what we love most. 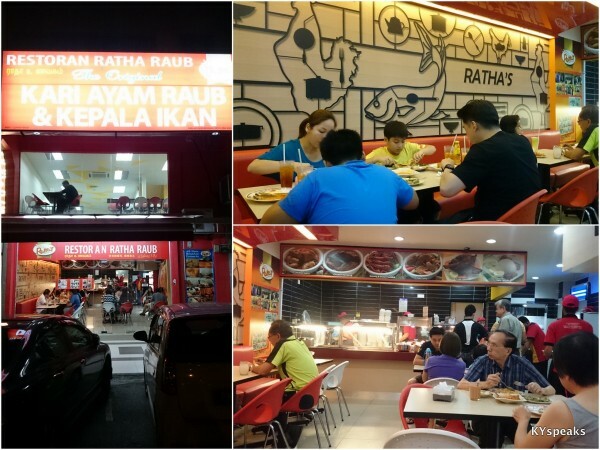 Ratha’s is a family own restaurant, and the original restaurant at Raub is one of the highest ranked eatery at the location on TripAdvisor, and this Damansara Uptown branch is operated by the second generation. 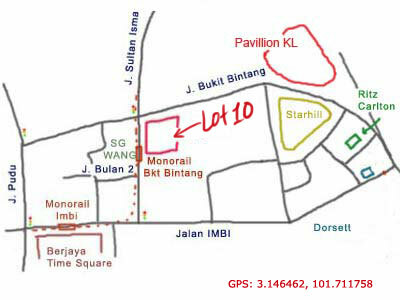 The restaurant is located at the side of Uptown facing LDP, which offers slightly better parking situations compared to the parking hell that is the “inside” of the commercial area. 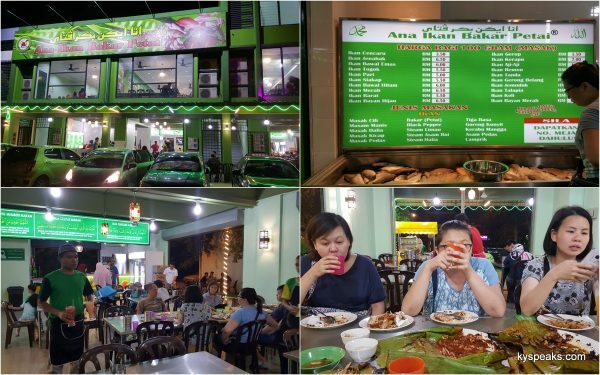 It is air conditioned, clean, and brightly lit, while offering a no-frill experience. The menu is a simple laminated sheet, but offering is quite comprehensive. 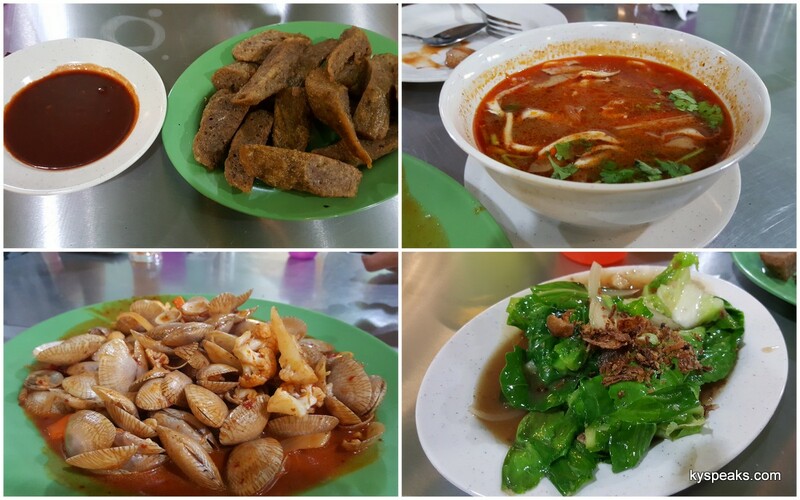 There’s seafood, poultry, meat, vegetable, and other individual dishes if you prefer not to go with steamed rice. 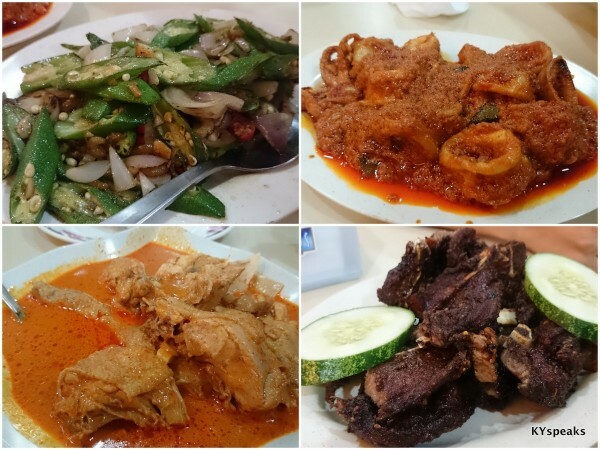 For dinner, we shared stirfry bendi, sambal squid, curry chicken, and fried lamb for the three of us, and they turned out to be quite delightful and properly flavored while not being overly spicy. 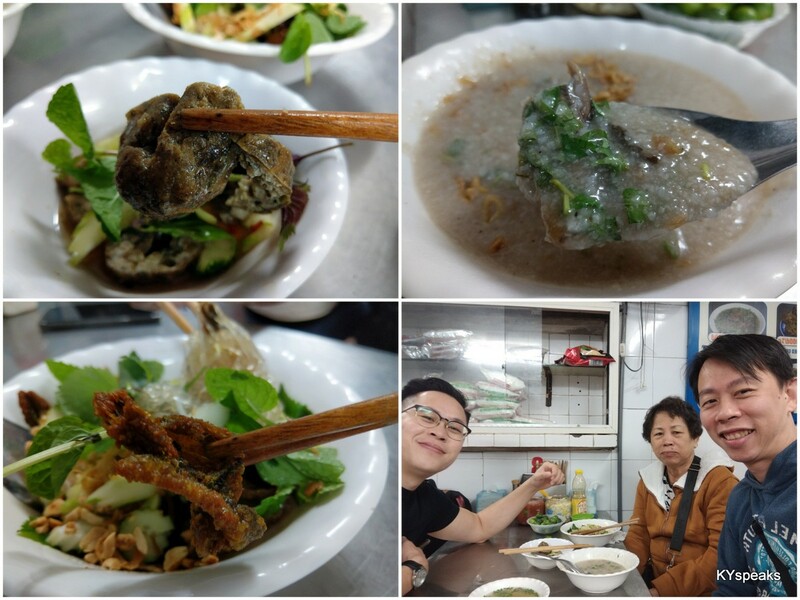 I’d wished that we ordered their famous fish head curry, but perhaps that would be more fitting to a larger group. clean and comfortable dining concept for mamak food, what’s there not to like? 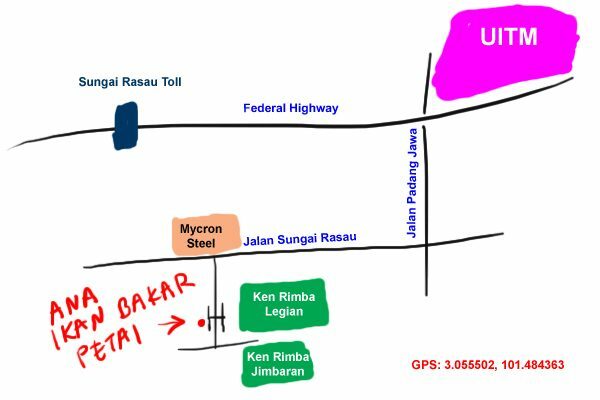 If you’re up for some good old fashion Malaysian Indian cuisine in a comfortable set up, this would be a good place to start.